I am relieved and freed to realize that what is set before us is enough. It might seem small in the eyes of the world, but it is very important work. As Christian writers and speakers we have raced for the stars, trying to shine brightly for His glory, but I’m afraid we’ve burned up some things in our wake. And we’re left feeling burned out and wondering how we got here and how we can get better. Out of the gate we started off strong, but now many of us are limping since we tripped on the stage’s “platform”. Our families are suffering because we’ve been a little bit too M.I.A. as we work hard to chase after the “big one”—that next opportunity that dangles in front of us, just out of reach. We’ve missed the main event. Somewhere along the way we went from a willing stage hand to wanting to be the main attraction, and we got disoriented. We wanted to be important, significant and make a difference but those longings have gotten out of balance and perhaps have turned to a lust that will never be satisfied. We’ve modeled our dream pursuits after others who are running on ahead with a different gait, and to a different tune. Oh sure, we’re in the same race, but we thought our leg was a 100 meter dash when in actuality it’s turned out to be an ultra-marathon. Work, work, work. Make things happen. Strive harder, drive more traffic and then, guess what? you run out of gas and wonder why you’re broken down on the side of the road and there are dead bodies left in your wake. This is often what happens as we push our dreams forward on our own strength, being wise in our own eyes, and ignoring the warning signs along the way. 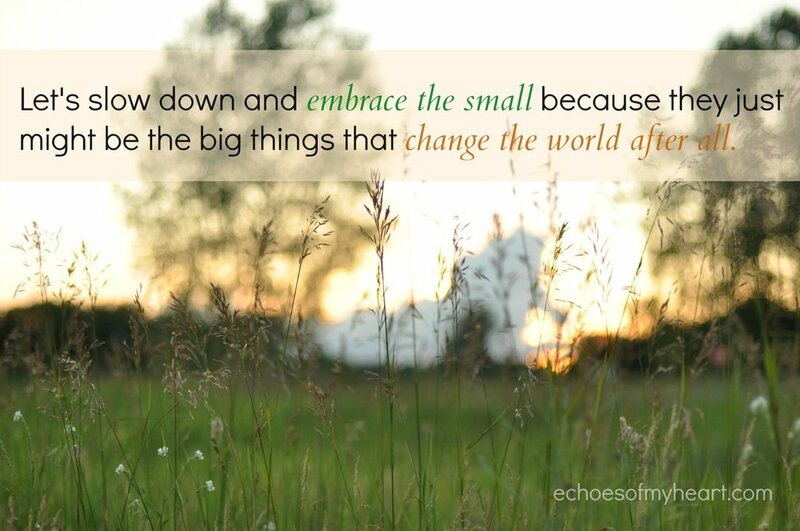 Let’s slow down and embrace the small because it just might be the big thing that changes the world after all. As we are faithful with what’s before us, keeping pace with His grace on this race, we can rest easy knowing that we are in step with His Spirit. The time is now, to turn from our crazy, rat-race ways and embrace the small parts, the important parts, of our lives. P.S. I am linking up with Kelly for the #RaRaLinkup and Holly for #Testimony Tuesday. Thank you, thank you, thank you. I’ve been struggling with some decisions and this helped give me some perspective. So glad to hear that Rose. Making to much of those dreams is a mistake. God Himself far exceeds any of His gifts…if we could just fully believe that and latch on with both hands. And speaking of hands, mine are full. With what God placed in them. I don’t to be running after next, and miss NOW. So glad we connected on the #Raralinkup! Thank you Chrisy. Yes, hoping we latch on this with both hands. I know I need to. One of my favorite principles is “despise not small beginnings.” It is in the mundane, everyday stuff that the miracles take place. I believe that with all my heart. xo Good post. Hi Gina- Yes, freeing indeed! Katie, I relate to this post so much. I’ve always wanted to do things, non stop!!! But I had to stop my style of life and let God change it, His ways and His plans for me. I’m already walking on that! Taking one step at a time, enjoying every little detail of life. Thanks for sharing and encouraging! I’m visiting you from #TestimonyTuesday. Thank you for commenting Tayrina. One step at a time, I need to be reminded of that for sure! Amen Katie. Don’t disregard the small beginnings. We are on big family with the same Father. Just like siblings in a family we grow and mature at different rates. We are all unique and special in His sight! I had not heard of that saying before – about the small being the new big, but there is so much wisdom in your words. I have been learning this lesson in my own life. To cease striving, and be present in the moment, in the place that God has placed me. Your post was so encouraging. Thank you! “To cease striving and be present in the moment”- yes and thank you! Thank you for this reminder, Katie! It’s so easy to forget that God is our publicist! I have been caught up in that race to the BIG thing and need to remember to slow down! I love how you pointed out that it might just be the things we perceive as small that God uses to change the world! These are words of wisdom. I can feel this struggle happening in my own life. I head down a path with good intentions guided by the Holy Spirit. Then I say, “Hey, hand me those reigns for a minute. I think I have a good idea. No this will be better. Yeah, let’s follow my plan.” Full steam ahead I exhaust myself, secretly feeling frantic, until I realize that I’m going in the wrong direction. When I’m following the Spirit there is peace. When I’m leading the show there is unrest. It’s a sure sign! But truly the Spirit moves slower than I’d like most of the time. Praying for the patience to follow. Thank you for this message that is so in line with my prayers today. I can so relate to what you said here Jenni! Love love and love!! One thing that I’ve been learning lately is that His dreams are always bigger and better than I could ever imagine. If someone had told me 11 years ago that I’d have to go through everything that I have had to to come to this realization I never would’ve believed it. I still don’t know what I’m supposed to do yet, but we’ll figure it out together! Great is His Faithfulness for sure. May He hold you close as you live and breathe for Him. So timely, Katie! God has been placing these same feelings in my heart lately, but the way you put them into words is absolutely perfect. The more I’ve focused on the small but oh-so important things around me, the more I feel God’s hand of blessing, protection, and peace. Thank you for this awesome word! Thank you Kristine- love your thoughts here. This is a fabulous post! It is a marathon Katie. I don’t want to be so caught up in the goal that I miss the joy of the run. Thank you for encouraging my heart today in a way that it so needed. Love you dear friend. I am so blessed by you! Cheering you on from the #RaRalinkup on Purposeful Faith. Yes, Kelly, a marathon that I often try to sprint- a sure formula for burnout.